Construction is under way for the exciting new miniature golf course at the Wembley Golf Course . 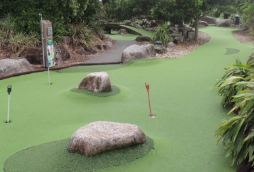 The mini golf will be unique to Perth as the course will be a scaled down version of a full sized golf course including bunkers and water features. This unique project will be opening in December and will be kicked off with a celebrity tournament sponsored by GlobeVista . Menu Magazine – The Ultimate Guide to Wining and Dining in W.A.